1. CEOs get paid well regardless of corporate performance. Look at the attached top ranking CEOs in 2015. 2. The CEO share of profits can range widely, which includes large chunks of net income. 3. 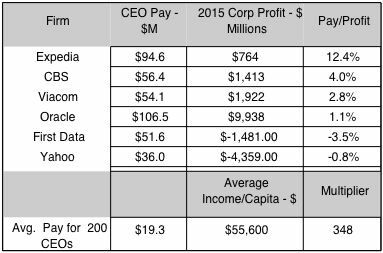 The disparity between CEO average pay for 200 CEOs and average US personal income is a large multiplier (e.g. inequality indicator). IMPLICATIONS: The big multiplier of average income to CEO incomes is one of the most dramatic indicators of income inequality.